What is the Communication and Entertainment System Like in the BMW 2 Series? The communication system in a vehicle has gained importance over the past decade. Where previous communication systems were limited to a shout out the window, modern technology allows car occupants to stream their favorite sounds, shows, and friends continuously. In the BMW 2 Series, occupants can communicate with home from anywhere in Bentonville through the onboard hands-free communication system that covers both Android and iPhone applications. Android Auto and Apple Play cover nearly every smartphone in the U.S through the smart device integration program. For entertainment, standard items like AM/FM Stereo and HD Radio are necessary features that augment an onboard MP3 Player and an auxiliary audio input system that broadcasts the sounds coming through a streaming smartphone throughout the car interior. 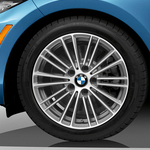 At BMW of Northwest Arkansas, our technicians are well versed in the inner workings of the communication and entertainment system of the BMW 2 Series.